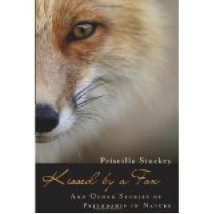 Book Review: “Kissed by a Fox: And Other Stories of Friendship in Nature” by Priscilla Stuckey, Ph.D.
Table of Contents: JSE March 2015 — Sustainability: What’s Love Got to Do with It? Abstract: In Kissed by a Fox: And Other Stories of Friendship in Nature, Priscilla Stuckey, Ph.D. presents a collection of stories as an integrated whole. The purpose of this book review is to offer this work of creative non-fiction as an illuminating example of how love and relationships are essential ingredients for sustainability. Kissed by a Fox is fundamentally about relationships between humans and other-than-human beings. Love for the natural world and one’s self are consistently described throughout the book as necessary for taking in and giving out what will sustain us and the earth. Stuckey delivers this message through narrating her experiences with “friendships in nature” and how these relationships transformed her life. Kissed by a Fox: And Other Stories of Friendship in Nature by Priscilla Stuckey, Ph.D. has received praise from Richard Louv, author of The Nature Principle and Last Child in the Woods, Temple Grandin, author of Animals in Translation, Publisher’s Weekly, the Seattle Star and more. The book won the 2013 WILLA Award for Creative Nonfiction, the 2013 Nautilus Silver Award for Animals/Nature and the 2012 ForWord Book of the Year Silver Award for Nature. Although Stuckey’s highly praised book includes so many interesting topics for the reader to explore, the purpose of this book review is to offer this work of creative non-fiction as an illuminating example of how love and relationships are fundamental ingredients for sustainability. Throughout Kissed by a Fox Stuckey narrates an intricately woven tapestry of personal experiences, history, philosophy, theology and ecology to illustrate how she discovered and experienced a deeper connection with the natural world and how this transformed her life. Stuckey describes how she came to recognize the relationships she had with what she calls, “more-than-human beings” such as an eagle, a tree, a dog, a baby bird, a fox, a creek and others. The book is organized as a journey through these extraordinary relationships with each chapter dedicated to a significant relationship. Each chapter describes what aspects of the relationship contributed to Stuckey’s understanding of love, loss, recovery and resilience. Through acknowledging each connection or relationship, it is as though the author’s heart opens ever wider and she finds strength to heal and make peace with her past and life’s ongoing bumps and bruises. Through documenting this personal journey, the author articulates how love and relationships are the base elements for a sustainable future. Kissed by a Fox is fundamentally about relationships between humans and other-than-human beings. Through personal memoir and meticulous research across genres and philosophies, Stuckey narrates her journey through the realization that our minds are one with nature. Jung’s theory of synchronicity (p. 64-65), the ability of our inner sight to foresee events in the outer world or a “meaningful coincidence” is one of many examples provided to illustrate how we interact with the natural world. Stuckey takes the concept of synchronicity further by linking it to indigenous knowledge which across traditional cultures and places speaks of our “relations” or a deeply personal connection to all beings that inhabit the places we dwell (p. 67). These personal relationships with the more-than-human can provide just-in-time knowledge about how we are living our lives, insight to a solution we had not considered, or remind us of our many blessings. The word “love” appears in the text or within a quote twenty one times throughout Kissed by a Fox (Index, p. 371). Love for the natural world and the self is also inferred through the personal narratives that consistently arrive at love and relationship being the answer to grief, despair, inner and outer destruction of ourselves and the earth. In Chapter 1, “Cut-Leaf Weeping Birch” the author has one of her first experiences acknowledging a relationship with a nonhuman being. Her favorite weeping birch tree from childhood popped up in her mind one day while she was living on the other side of the country from her childhood home. Later that day she learned the tree had a disease and would be cut down, she then understood her vision as the tree saying goodbye (p. 25). This acknowledgement of friendship with a tree is a pivotal moment for Stuckey as she begins to open her heart to love and friendship beyond the human domain. In Chapter 2, “Hooded Oriole” Stuckey learns to apply her newfound understanding about synchronicity and caring for our relations to her own life. Through caring for a baby oriole that fell from its nest, Stuckey begins to see the parallels between this vulnerable creature and herself at that moment in her life. Learning from the baby bird helps Stuckey make bold decisions to love herself and move forward. Stuckey cared for the bird and in turn the bird taught her a valuable lesson – this is reciprocity. Similarly in Chapter 4, “Red Foxes” Stuckey learns what it means to become a trusted member of a fox den. She is surprised and honored by her kinship with a rescued red fox named Rudy. In Chapter 8 “Peralta Creek” Stuckey explains, “Our relationship with the creek started innocently enough” (p. 201) when she moves into a house on a steep slope with a creek for a neighbor. Over time she gets to know the creek and grasps how much of the surrounding landscape has been shaped by water. As she comes to understand the complexity of a watershed and the ecosystems within, Stuckey becomes involved with the creek on a personal level and as a community activist. The activist work connected the author with neighbors and other local activists adding a dimensionality to the power of relationship building at the community level. In chapter 7, “Ancestors”, love through relationship with the earth and natural forces is explored by discussing indigenous knowledge. A deep sense of place and acts of reciprocity are an integral part of indigenous belief systems. After suffering through a prolonged illness, Stuckey begins to unravel the relationship she had with her own parents and ancestors. Her Mennonite ancestors that settled in Ohio transformed the landscape from swamp and forest to farmland. Stuckey explains the mentality of settlers, pioneers, colonists and conquerors in the Americas as a dearth of love and sense of place, “The pioneers were immigrants and conquerors. They had arrived at a place they could not love. They would seize a world that was new to them, destroy what was there, and repopulate it with their own kinds” (p. 188). Stuckey’s acknowledgement of her ancestors and the possibility of another path, aided her process of healing and connection to the relationships that gave her strength and love, “the path toward control stretches away from love, and too much of what Western society has received from ancestors leads not toward love but away from it” (p. 193). Ultimately, healing comes for Stuckey not through traditional therapy but through ceremonial healing which teaches her to listen “…in therapy I was talking; in ceremony I was deeply listening” (p.195). In Chapter 12 “Earth” the linkage between relationships, love and care for ourselves and the earth come together. Stuckey offers sage advice and vision for a sustainable future, “Cultures that are sustainable help one another remember interconnection. They value reciprocity and fairness, and they build interdependence into their systems of exchange. They teach their children to respect others, both human and other than human…They use local resources, yes, but first of all they love those resources as relatives” (p. 330). Stuckey connects the inner and outer spheres of experience by explaining, “For what is gathered in must be given out” (p. 330) which in a crude vernacular could be interpreted in the negative as “garbage in, garbage out” or in the positive as; receive love, give love. Repeat. We can choose what we take in and what we put out. I admire Priscilla Stuckey’s courage and perseverance to write down what was in her heart. Kissed by a Fox: And Other Stories of Friendship in Nature is as much an enjoyable read as it is thought provoking. It offers humble testament to living sustainably with oneself and the earth. It is powerful to follow Stuckey’s life story through suffering, healing, love, loss, change, transformation and calm. I encourage the readers of this review to read Kissed by a Fox and reflect upon your own experiences with “friendships in nature” and what they have to do with love and reciprocity in your own life.